Fully reconditioned, previously owned LKB 7800 KnifeMaker with new scoring wheel. Repaired and adjusted to A-1 condition. 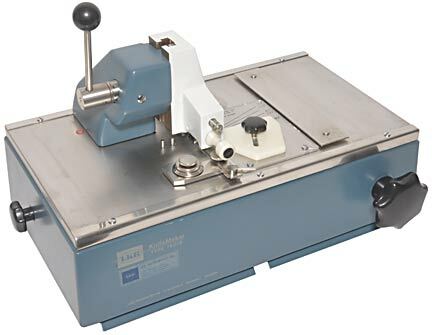 If you use glass knives for trimming, thick or ultrathin sectioning, you can use this unit to make the best knives you can get. Includes glass knife fork tool. Comes with a 90 day warranty. Set up to factory specifications for 25 and 38mm wide glass strips and a thickness of 6-7mm. Note: We have a special re-usable shipping crate available for shipping this heavy unit to you. A deposit is required for using the shipping crate, but the deposit will be refunded in full when the shipping crate is returned to us within 7 working days after receipt of the reconditioned KnifeMaker. Glass knife fork tool is used to safely pick up glass knives made with the LKB 7800, LKB 7801, LLKB 2178 and Reichert-Jung knife makers. Made of stainless steel with plastic sleeves to protect glass knife. Replacement for the one supplied with the knife maker.